I wanted to make blueberry cheesecake but I don’t have blueberry at home so I check the internet for possible recipes with cheesecake but I did not get anything I like so I used the recipe of no-bake blueberry cheesecake, I just change some of the ingredients. 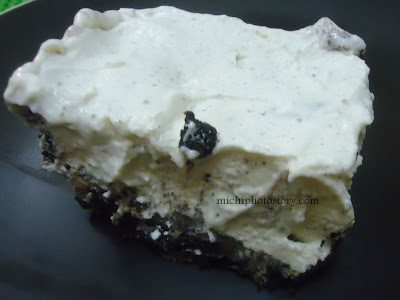 Mix oreo cookie crumbs and add butter to bind. Mash well. *Crust mixture should be close to texture of moist sand; add a bit more butter if too dry. Transfer and press evenly on bottom of ungreased springform pan (or any pie dish you prefer). Place in the freezer to harden crust while you make the filling. Using a mixer, whip chilled cream with 2 tablespoon sugar until stiff. Set aside. In a separate bowl, gradually mix remaining sugar into softened cream cheese. Beat until fluffy and set aside. In a small sauce pan, combine milk and gelatine powder. Heat until completely dissolved (don't boil, use a wire whisk while heating to remove lumps). Remove from heat, pour and beat into cream cheese mixture. Fold in cheese mixture to the whipped cream and beat on medium to high. Add few pieces of chopped oreo cookie. Bring out pan from freezer and pour in the cheesecake filling. Spread evenly with spatula and tap pan lightly to set and release some air bubbles. Cover pan and chill for a few hours. It was a sure hit to my son but hubby and I still prefer the no-bake blueberry cheesecake because eating oreo cheesecake is like eating cookies and cream ice cream. Hehe!